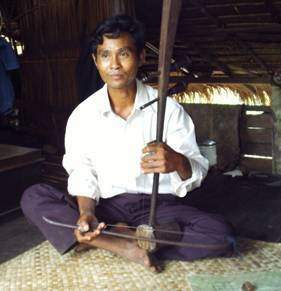 Chhon (pronounced Chawn) plays a traditional stringed instrument and has composed songs in his native tongue, Kuy. He is also a leader in his village. But, these are not his primary occupations. He is growing rice. He must walk three kilometers to reach his fields. In a good year, the one crop may cover the needs for his family. They have had seven children, five of whom are still living. His house barely sleeps the family and houses his rice wine still, a common thing in village homes. 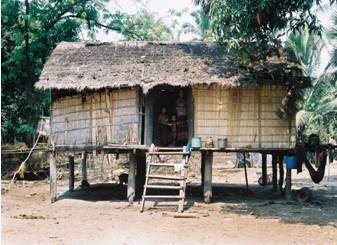 It is a poor house, made of bamboo slat floor and thatched walls. It is raised on stilts but not very high, not high enough to stand, or hang a hammock underneath, like wealthier Cambodian villagers. Chhon is pretty typical of the Kuy people in Rumchek (pronounced “Room Jake”). Some have a little more and some a little less. 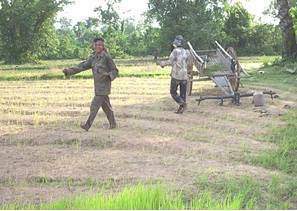 All are more or less dependent on the rice harvest and live very close to the edge. That is, if the harvest is bad, someone gets sick, the cow dies, etc. the whole family can be thrown into ruin. There is a primary school in Rumchek, but lessons only go as far as two or three grades and are taught in Khmer, a second language for these people. Chhon has had little education, yet he speaks Khmer, though “not all,” as they say. His children may or may not get to go to school. Depends whether there is a little money to supplement their “free” education, whether they can be spared at home and whether it seems important. Most Kuy are illiterate, from lack of opportunity to learn to read and lack of material to read if they knew how. Reading is just not very relevant to their lives. Rumchek has one advantage that most other Kuy villages do not. It is on the main road which goes from one provincial capital to another. It is possible to reach it by road at any time of the year. Many villages are far from any “main” road. 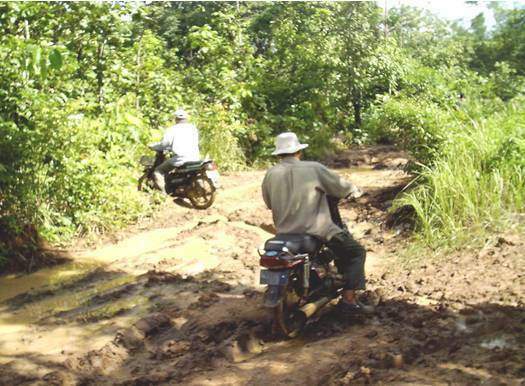 In the rainy season the tracks that serve as roads turn to muddy trails and in some cases are impassable, especially when swollen rivers cannot be forded. Pray for us to know how to get the gospel in to such places and how to present it to a people so outwardly different from us. Also lift up Chhon as he grapples with new concepts, that he will fully put his trust in Jesus.